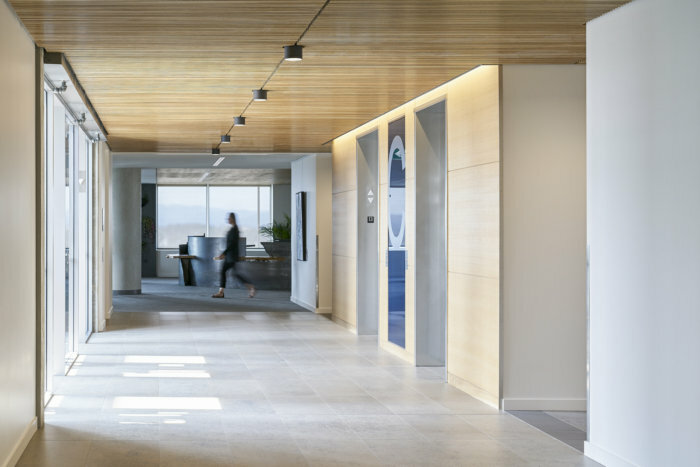 Kasian Architecture Interior Design and Planning designed BCI‘s offices to accommodate varying work styles for employees of the investment management corporation located in Vancouver, Canada. The influx of a new generational work force hindered BCI’s ability to accommodate the varying needs of their new and long-standing employees, who were originally working within a traditional and static work environment. The shift in how and where their employees wished to work translated in Kasian co-creating a workspace that integrated a dedicated menu of space options: offices, workstations, small enclosed focus rooms, and large open work lounges. Each BCI staff retained their home base, but the introduction of alternate space options now provides them with a choice on how and where to perform their daily tasks. This future-focused design can constantly adapt to the evolving needs of their staff, support varying workstyle needs, and promote a new level of mobility and flexibility via modular walls and raised access floors.